As part of their Youth Leadership Programs, which fosters mutual understanding, respect, and civic engagement among young Americans and their international peers, the U.S. Department of State has created Youth Ambassadors (YAs), an initiative that brings together high school students and adult mentors from countries across the Americas to promote mutual understanding, increase leadership skills, and prepare youth to make a difference in their communities. Exchanges are primarily from Latin America and the Caribbean to the United States, but also include delegations from the United States to select countries. During the exchanges, participants engage in workshops, community service activities, team building exercises, meetings with community leaders, and home stays with American families. Upon their return home, the students apply what they have learned to implement projects that serve needs in their communities. With a large number of alumni from the program, it was in 2009 when a generation of committed YAs took concrete steps to transform the idea of a network into a reality. Using Facebook platforms, YAs from different countries worked together to craft the proposition of the first Youth Ambassadors Summit ever. With the help of Partners of the Americas, this project proposal reached the U.S. Department of State, which gladly sponsored it. Therefore, under Partners of the Americas’ coordination, the first Youth Ambassadors of the Americas Summit convened 50 youth leaders from 19 countries in Panama to launch the International Youth Ambassadors Network(IYAN). The Summit was focused on creating innovative opportunities to help youth develop leadership skills and cultivate a new generation of leaders in the region. The Summit also brought partner organizations like World Learning and YMCA to behold the first steps of the network, which the firm idea of developing a platform inclusive to all organizations and partners who lead the Youth Ambassadors program in different countries. Promotional image of the IYAN + RED2021 social media campaign. IYAN is an inclusive network that needs the participation of Youth Ambassadors to gain strength in order to accomplish its objectives. Youth Ambassadors from all countries are welcome to share their stories, projects, ideas, recommendations, etc. There is immense potential in our network. From the basics of sharing and learning from different activities and projects to, for instance, grant opportunities to successful projects. Though the network is still very young, it is growing fast and with a worldwide perspective. During the 2nd World Summit on Youth Volunteering organized by theInternational Association for Volunteer Effort (IAVE), IYAN representatives led a panel showcasing the progress in the creation of the network. Also, many of its members are part of the RED2021 initiative, a Latin American campaign linking personal and organizational youth volunteering commitments. 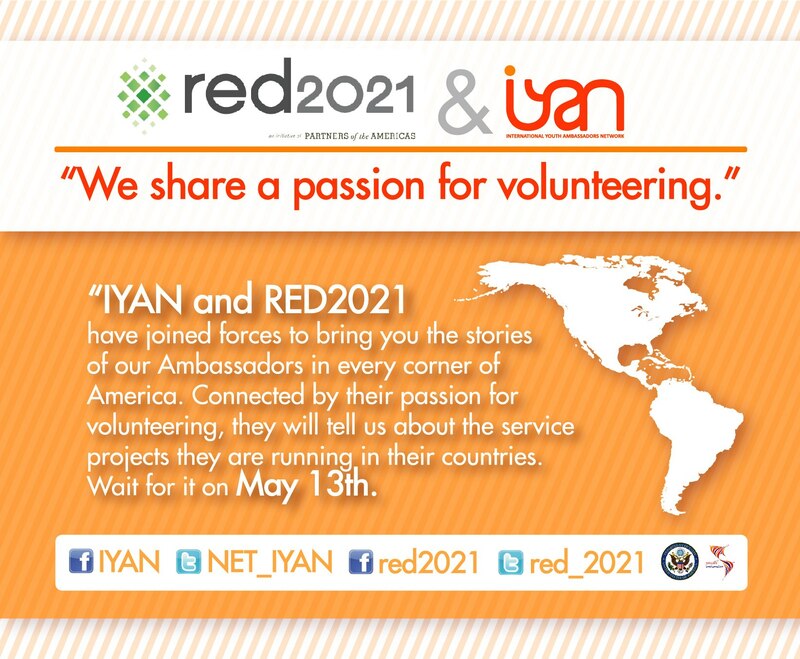 IYAN and RED2021 have joined forces to celebrate the work of young volunteers all over America, by creating a social media campaign that promotes the work that their members are doing in all regions of the hemisphere. With projects that go from teaching English to kids in underprivileged conditions to campaigns for raising awareness of the environmental dangers of wasteful battery use, these young volunteers are targeting specific needs of their communities, combining their efforts to provide sustainable solutions and showing the world the incredible impact that youth have when they work connected and following their passions. We invite you to follow our campaign and get to know more about our projects in our IYAN and RED2021 Facebook pages and Twitter accounts (@net_iyan and @red_2021).